It's Day 3 of my stamp set spotlight on Kindness Matters. It seems a lot of people overlook this set as it is so simple. However, I think this is a great, versatile set to add to any collection. Whether you're an experienced stamper or just starting out, Kindness Matters will have you designing beautiful cards and gifts in no time! A simple 4"x4" card, this versatile design can be used for both masculine or feminine recipients. Change the wording from "Thanks" to "Kindness Matters" and it becomes even more versatile. The colours, Pacific Point and Lucky Limeade just make this card pop! The "rock n' roll" technique helps give the card a little something extra. Add a few basic pearls or even basic rhinestones and your butterfly comes to life. 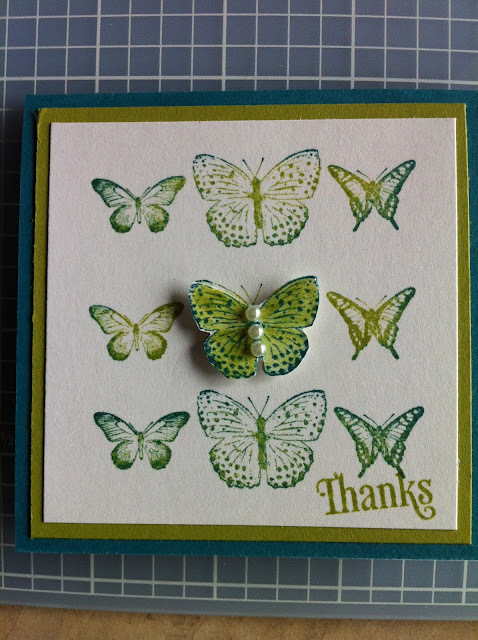 To learn how you can make this card, book your workshop today. Email or call me at 289-280-0304. Don't think you can pull together enough people, or don't want to clean for a workshop?, host a catalog party instead...just ask me how. As always, you can shop 24/7 at my online store by clicking on the Stampin' Up! logo at the top of the page.